A truly stunning example which ranks among the very finest copies in the hobby. 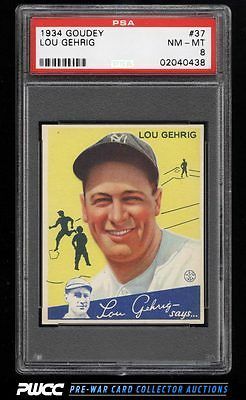 Many avid collectors consider the '34 Goudey Gehrig productions to be the single most meanful and coveted issues from the era; hard to argue against the Lou Gehrig 'says' slogan at the base and the million dollar smile of humble Gehrig above. This card really opops with stunning color and wonderful registration throughout. Easily the best PSA 8 we've sold in our history and one of very few to hit any public auction venue over recent times. All told this is a world class investment piece and comes with our highest recommendation. Part of an absolutely stunning '34 Goudey set break on the auction block this month. This set is the current #1 finest on the PSA set registry and holds some of the premier examples in the hobby. One of over 11,000 cards, lots, and sets up for bid in our 9th Auction of 2016. Click on the link above to view the other PWCC auction lots.